Hello, hello! I have been supremely lazy this summer—at least, when it comes to getting on my computer. Perhaps I’m rebelling after four years of law school, but I’m finding it hard to make myself sit down at a desk (or even on the coach) and do anything productive. Instead, I’ve been trying to fit in as much time with family as possible, and as many hours as we can outside. We’ve been so blessed this summer to be surrounded by family. Having visitors always means fun in the kitchen, too, and an excuse to make dessert. There have been some delicious fruit crisps and three-layer cakes around here lately. Whenever we have family come into town, we love to show off this beautiful place where we live, too. 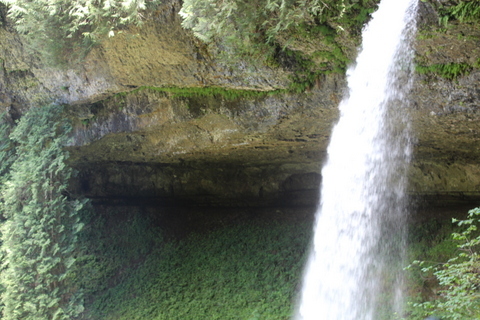 My favorite is usually Silver Falls, a kid-appropriate hike that has breathtaking waterfalls. Not an easy combination to come by. 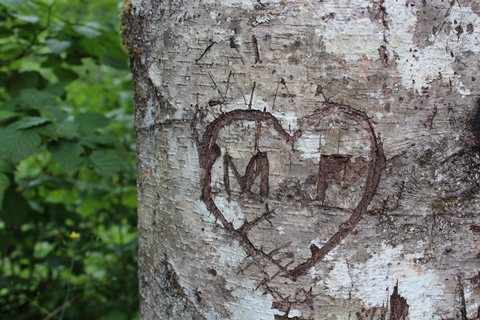 We took my brother and his fiancée there a few weeks ago. Soon we’ll head out on a long trip to go to their wedding. We can’t wait. (Except for the drive itself). And I’m excited to have another lovely sister-in-law. That will be twelve in all, if you count my sisters too. I feel lucky to have so many. I learn a lot from them. Summer’s bounty has been keeping us busy in between trips and visitors: canning raspberry jam and applesauce (I know, it’s not apple season, but I found 40 lb boxes at a steal), drying fruit, and freezing green beans. I’ve been trying to incorporate our harvest into meals, too, which means lots of dinners that consist largely of tomatoes or peas or green beans. And then, of course, there’s the zucchini. I’ve made these delicious cheese-and-zucchini-stuffed pupusas, shaved zucchini salads, zucchini pancakes, zucchini enchiladas, and zucchini brownies (twice). The recipe I’m just dying to share with all of you, though, isn’t necessarily a summer dish, but it could be as it relies heavily on cauliflower and spinach. I have been having tons of fun experimenting with cauliflower alfredo sauces, which I’m sure many of you have seen floating around. The cauliflower supplies the rich creaminess which normally comes from butter and cream, and the result is deliciously light. It’s a great way to sneak in veggies. 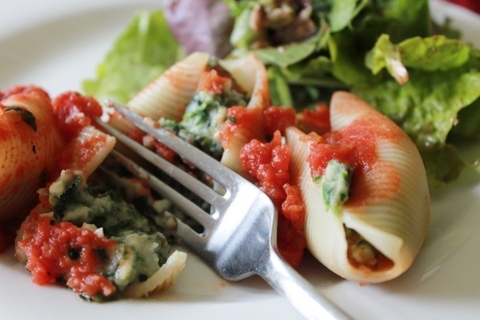 After trying it tossed with noodles and fresh peas (very good), I came up with this thicker version, mixed it with spinach, and stuffed it into pasta shells, topped with marinara and baked. Perfection. This is sure to please most eaters, so it’s a great dinner party meal. 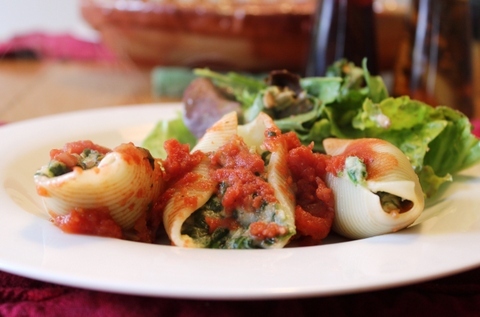 You can make the filling ahead of time, too, and even stuff the shells beforehand if need be. Just give yourself extra baking time to make sure everything gets hot all the way through. I like a lot of tomato, so I use plenty of marinara, but you could certainly use less if you like a firmer, more alfredo-intense texture and taste. I think this would be fabulous with some big scoops of pesto mixed in. In any case, I’m glad to be back cooking with you. I have such a catalog of summer tastes to share! What are your favorite summertime foods? S’mores might be at the top of my list, along with corn on the cob. Special Diets & Allergies: Vegan and dairy free if you use non-dairy milk, soy free, nut free, vegetarian. 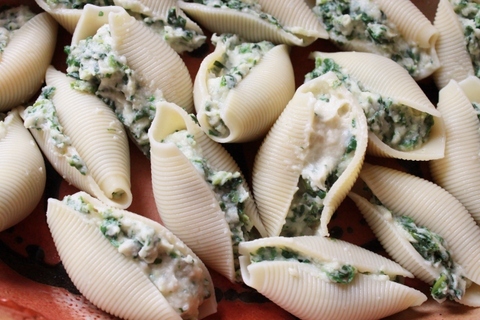 You could use brown rice pasta shells (I’m assuming they make them?) and it would be gluten free too. Tender pasta shells burst with creamy, indulgent alfredo sauce in this lighter version of an old favorite. Cauliflower gives the sauce its heft, but you’d never guess from its rich taste. The spinach and garlic add contrast to the subdued cream sauce, and it’s all baked in marinara until hot and bubbling. I invariably have a pasta shell or two break on me during the boiling and/or stuffing process, so I usually cook a few extras if I’m making this for company. Then I don’t end up shorthanded. Frozen spinach works just as well as fresh here. After thawing or cooking it (if using fresh), make sure you squeeze all of the water out. Preheat the oven to 400 and grease a 9×13 pan or large casserole dish. To prepare the filling, put the milk, olive oil, cauliflower, 1/2 t of the salt, and the garlic powder in a medium size saucepan with a heavy bottom. Cover and bring to boil over high heat. Reduce heat to medium high and continue to simmer until the cauliflower is so tender it falls apart when pierced with a fork, about 10 to 15 minutes. Pour the mixture into a food processor or blender and puree. (Careful! I always cover the top with a towel first to avoid being hit by steaming hot sauce!) Taste and add additional salt if desired. Stir in the spinach and set aside to cool a bit. The sauce will get thicker the longer it cools. Meanwhile, cook the pasta shells according to directions. Take them out a tad on the early side, while still very al dente, then immediately rinse in cool water to stop the cooking. Pour half of the marinara in the bottom of the pan. Evenly distribute the cauliflower cream sauce among the shells, and place them in a single layer, open side up, on top of the marinara in the dish. 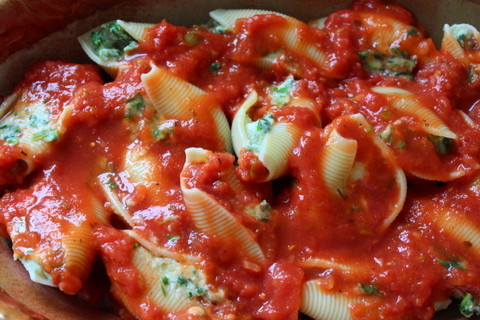 When all of the shells are filled, pour the remaining marinara on top of the shells. Cover the dish tightly with foil, and bake for 20 minutes. Oh, those look so delicious and comforting! Yes, there’s something about anything creamy that I find comforting. 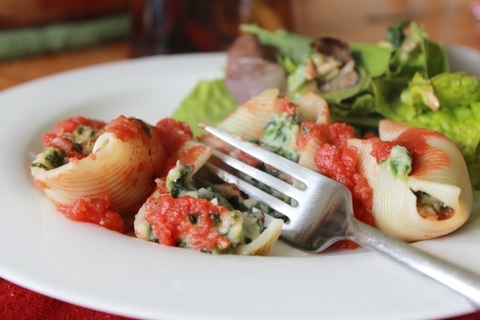 This looks so tasty–need to find gf pasta shells! And we can’t wait to see you! We can’t wait to see you! Happy travels. It’s a long drive. I’ve made these several times now…they are really great! I added a little basil that I preserved from the summer…so tasty!